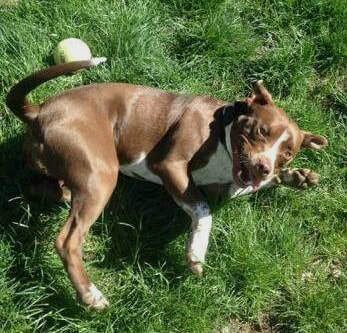 "Ginger was a dog that I found on (http://www.rescueme.org/ -- Colorado); She had an amazing smiling face and the sweetest eyes, but the description stated that she had been rescued from their local humane society (pound) at 6 months old and started off as a very sweet dog, but has since become aggressive. Having worked in veterinary clinics for years (I also studied animal behavior in preparation for vet school), I knew that it had to be something with her environment...and let's be honest, labeling a Pit Bull as aggressive is basically a death sentence for the dog. I asked the owner what her training methods were and how much activity/stimulation she provided for the dog. She told me, 'well sometimes I throw the ball out back for her'. I knew this was code for, 'we do nothing with the dog'. We set up a meeting to see if she would be a good fit for us. This woman met us and Ginger had a ribbon tied around her harness instead of a leash, her toys provided by the owner were a chewed up plastic plate and a worn down knuckle bone. I knew immediately that this dog needed a 3rd chance! Once I got her into my car she rolled over and I noticed that this owner had not adjusted her harness for her growth in the 12 months that she had her (now 18 months old). The harness had caused abrasions in her axilla (armpits) and her skin was growing around it. The middle toe nail on all 4 of her paws were broken down to the base of the nail bed and the dried blood suggested they had been like this for a while. 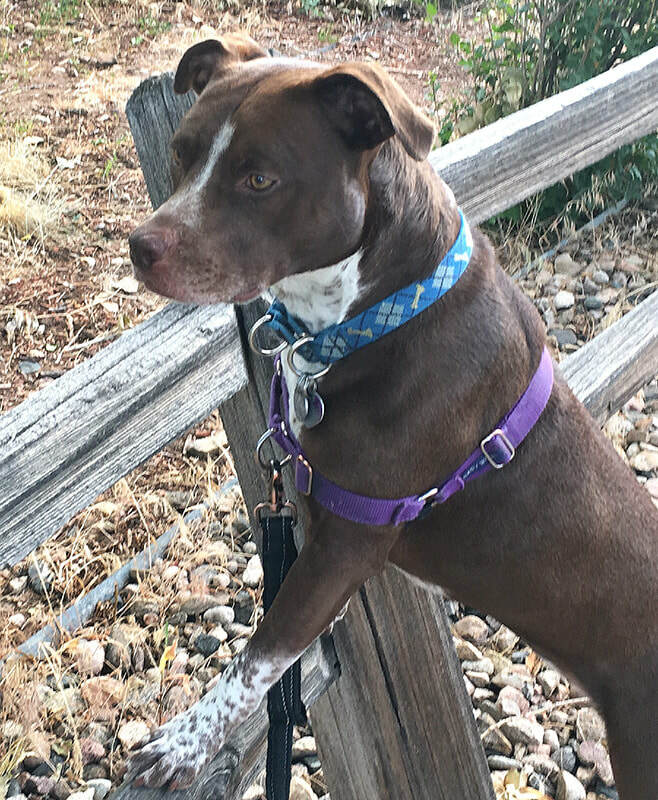 I have now had Ginger for 2 years and have been working very closely with her...with running, teaching her a consistent vocabulary, the right stimulation, and leash training this dog has never shown me aggression. She is also becoming less and less reactive/excitable as we get further away from her traumatic living situation. 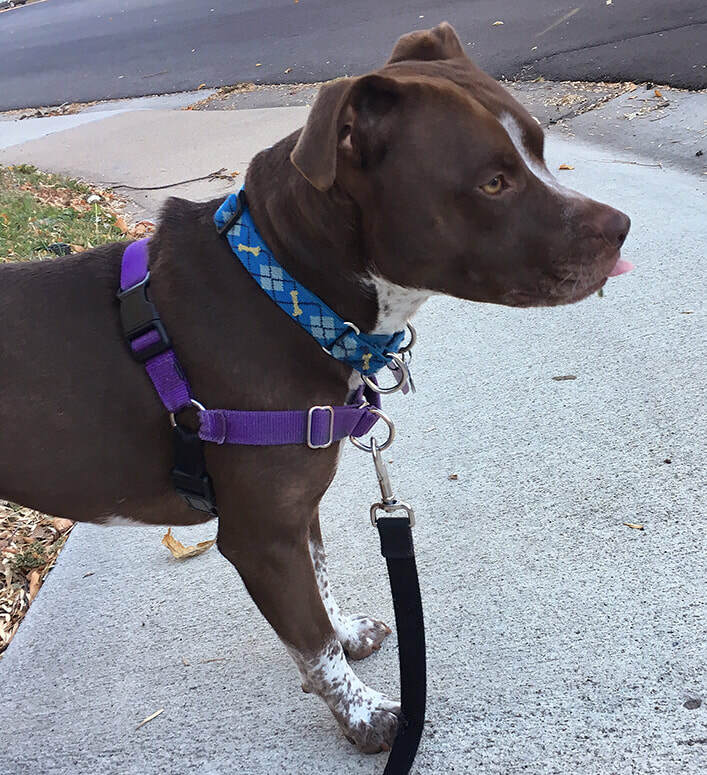 I think the owner that I got Ginger from had the right intentions, but did not have the proper know-how for what a dog of this breed needs (Pit Bull x German Short Hair Pointer mix -- seems the closest)."